It’s almost time for my summer holiday so I thought I’d do a quick post on what I’m going to be reading while relaxing by the pool. I’m not a fast reader at all, but when on holiday with few distractions, I can get through about four or five books in a week. So I often save up special books and also add books from authors who are new to me into the mix. I’m also taking a few trade paperbacks I’ve been saving up from my to read pile. 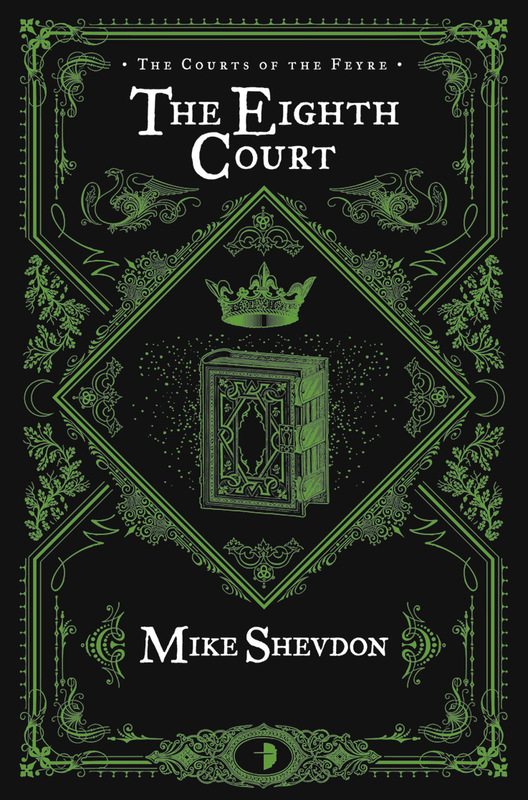 The Eighth Court by Mike Shevdon from Angry Robot Books. I have very particular tastes when it comes to urban fantasy, and just can’t get on with some series, so finding something that I really like is tricky. Shevdon’s books are one of my favourites and this is the fourth and final book in the series which is set in modern day in the UK. There are some scenes in London, but it is not London-centric, and throughout the course of the series we get to explore all sorts of places and buildings with historic resonance. I’m being very vague on purpose to avoid spoilers because he mixes real world history with the fantastical. We follow an everyman into this bizarre world hidden in plain sight and delve into the world of the feyre and a secret history of the world. 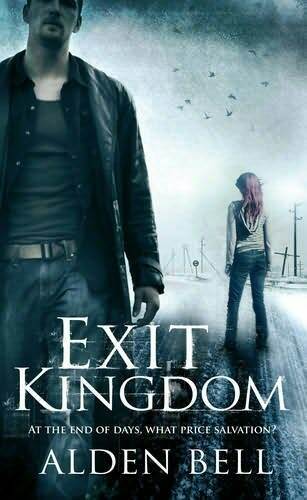 Exit Kingdom by Alden Bell from Panmacmillan. This is the second book by Alden Bell set in a post apocalyptic world where zombies have overrun the world. The first book, The Reapers are the Angels, is one of my favourite books, probably ever. I’ve also read it twice already and it only came out maybe two years ago. Yeah, it’s that good. I came to his first book completely cold, I knew nothing about it, and absolutely loved it. In a review I compared it to I Am Legend by Richard Matheson, but with zombies instead of vampires, so it’s really about the people, the situation and coping, it’s about isolation and humanity and not so much about running away from shambling ghouls. It’s also set many years after the fall, so it is not a world where everything has just fallen apart. The first book focused on a young girl called Temple and along the way she came into contact with an interesting character called Moses Todd. This book is set before the events of Reapers and this time Moses is the main character, along with his brother. I’ve been holding on to my copy of this since March when it came out and saving it. I’m really looking forward to it. 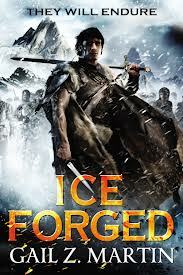 Ice Forged by Gail Z. Martin from Orbit books. Martin is an author I’ve been aware of for a while, but I’ve not managed to find time to read something by her until now. The blurb for this book sounded exactly like my kind of thing, and it is a nice dash of fantasy, which is different enough from the other two books on my list so far. So I’ve avoided reading any reviews or interviews about this and am going to come to it, and her writing, completely cold and see what happens. This is also the first book in a new series by Martin, so if I enjoy her work I can back and pick up some of her other novels in the interim until the next book in this series comes out! Discovering a debut author is always brilliant, but coming to a more well established one that I’ve just missed out on until now for whatever reason is a real treat as there is a lot more to read with no waiting. 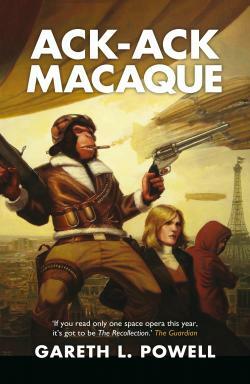 Ack-Ack Macaque by Gareth L Powell from Solaris Books. The first time I heard anything about this book was at Eastercon this year where Gareth was doing a reading. The reading was funny, crazy, full of action and very exciting. After investigating a little further and reading the blurb on the back I immediately picked up a copy at the convention. What’s not to love? A one-eyed cigar smoking monkey who was a Spitfire pilot in WW II. I’m sold on that sentence alone. From what I’ve read in reviews and from overhearing other people talking it, I think the book is going to be jam packed full of action and humour, making it another very different book to the others I am taking with me. The Name of the Wind by Patrick Rothfuss from Gollancz. It’s easy to assume everyone knows what this book is about and who Rothfuss is, but I’m also aware other people will be horrified that I’d never read a book by Gail Z. Martin until now as she is not a new author. The fact is there are a lot of authors out there, the fantasy market is more crowded than twenty years ago, and all of us only have so much time and varying levels of awareness via our various media channels. I’m very aware of who Brandon Sanderson is, and I have one of his books on my pile to read, but so far haven’t got around to it. Once again it comes down to too many books and not enough time. So, The Name of the Wind is the first book in the Kingkiller Chronicle, an epic fantasy tale by Rothfuss who I would describe as a storyteller. By that I mean he creates a wonderfully dynamic and rich world without bogging the reader down in pages and pages of detail. His story in some ways feels like an urban folk tale, about someone who actually lived, or it’s a parable that has been told down through the generations. It’s also very hard to describe the book as it doesn’t fit into any pigeon hole and is hard to put it alongside other books for comparison. It tells the story of Kvothe, a figure of legend almost, a man feared and loathed by some and respected and loved by others. The story begins with him as a grown man telling a scribe his version of events, starting with his childhood and gradually bringing him up to the present. But there are also chapters set in the present so it’s not just a look back at another time. Kvothe is also a renaissance man, and again you can’t say he’s a wizard, or warrior, or mage etc, he’s just a man who has adventures, gets caught up in weird and wonderful events, gets in to lots of trouble, goes through some terrible and awful moments, but also makes some amazing discoveries full of wonder and maybe even a touch of magic. There is a lot to tell, there’s no doubt, as Kvothe has lived a very interesting life and this first book is pretty weighty, and is one of at least three. The second book is even bigger I think but again, this is not because Rothfuss spends ten pages describing the smoke coming out of the chimney. This book has sold a lot of copies, I mean hundreds of thousands, maybe even a few million. It’s incredibly popular and rightly so in my opinion. It’s one of those lightning rod books in the genre like Lynch’s Lies of Locke Lamora or The Painted Man by PV Brett, or The Blade Itself by Abercrombie. It’s an incredibly unique book, something that is not perfect, and there are some bits I didn’t like, but overall it marks Rothfuss as an incredibly talented writer and someone who is forging ahead and doing his own thing, which others will then seek to imitate. This is the second time I’ve read Name of the Wind, because it was quite a while since I read it, and now I have a copy of the second volume staring at me. I’ve also forgotten quite a bit from the first time around so I want to sink back into this rich world, rediscover the nuances of the character and get myself up to speed in readiness for reading book 2, The Wise Man’s Fear. Reading comics is a very different experience for me compared to novels. It takes me a bit of time to sink back into a book, but with a comic I can read for five or ten minutes, read an issue and I’m in the story almost straight away and can be completely satisfied. So I always take a few trades to read for those smaller gaps of time when I want to read something. 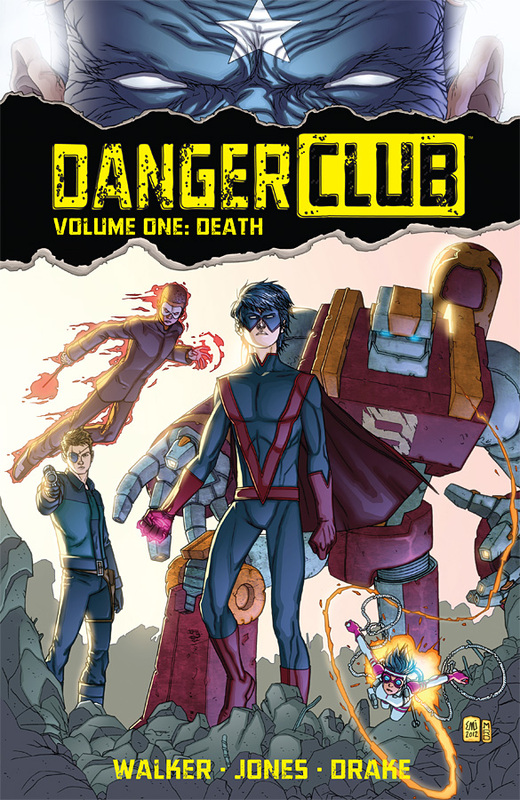 Danger Club by Landry Walker and Eric Jones from Image comics. I read the first issue of this when it came out a while ago, thought the premise was very interesting, thought the artwork was amazing and the colours very vibrant. Briefly put, all of the worlds superheroes go off into space to fight a very serious threat and then they never come back. So, suddenly all that’s left are lots of sidekicks and kids with powers. So it’s a bit Lord of the Flies, and it focuses very much on the next generation of heroes and villains. What do you do when your mentor is taken away from you? Are the junior heroes ready to cope? And if not, what will they do? What effect will the responsibility have on them? Likewise for the junior villains. Are they really capable of carrying out some terrible acts? 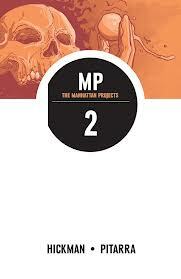 Manhattan Projects Vol. 2 by Jonathan Hickman from Image comics. Simply put, what if the Manhattan Project that we know about was simply one of many strange, weird and wonderful scientific projects that were being worked on by the best minds at that time in history. This twisted science fact meets science fiction book focuses on a group of very weird almost mirror universe versions of well known historic scientists getting up to all sorts of stuff. It involves portals to other worlds, alien invasions and lots of other weird science. Hickman writes for Marvel comics and is known for writing very big stories, and by that I mean long term, big sky, complex but not convoluted stories which are structured into chapters almost like a novel, with rewarding endings. He did a great run on Fantastic Four that was planned out years in advance and now he is doing the same on Avengers. This comic is a breeding ground for all sorts of ideas he probably can’t fit in other places and for some stuff that is too weird to go into a mainstream comic. 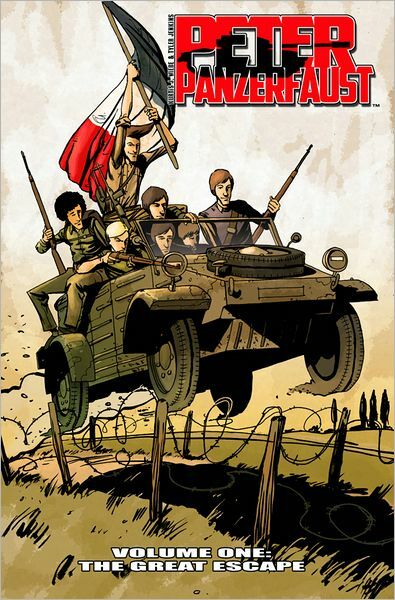 Peter Panzerfaust Vol. 1 by Kurtis J. Wiebe from Image comics. Peter Pan, and the Lost Boys, in World War II. That’s pretty much it. I read the first issue a long time ago, then lost touch with the series for some reason, but now I’m trying to catch up in trade. It begins with an almost Band of Brothers storytelling device, where an old man is talking about his experiences during the war, and it then flashes back to him as a young boy meeting a heroic and dashing and strange young man named Peter. The scope is vast, the twist on characters is only limited by imagination and this series has been picked up by the BBC to be adapted first into a digital motion comic (for some reason) and then later a live action TV series. I can see the latter working very well, not sure what the point of the former is, given that motion comics are the new dodo, and the real evolution in digital comics is coming from Thrillbent.com. Check out the website for free digital only comics where they are pushing the boundary of digital. Anyway, this series looks like a lot of fun and I really enjoyed the first issue. 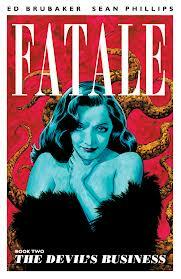 A possibly sneaky fourth trade, if I get time, is Fatale Vol. 2 by Brubaker and Phillips. It’s crime meets Lovecraftian horror. Meta fiction within fiction, weird people who don’t appear to be quite human, strange cults, immortals, demons, random chaos that actually points towards something else. Lots of ideas thrown onto the page and you have to hold on to your seat and just enjoy the ride.